The Company's Honorary Curator, Dr Andrew Wilton, will be writing occasional articles on works of art owned by the Company. Henry Stone was the eldest of the three sons of Nicholas Stone (1586-1647), Master Mason to both James I and Charles I, and a prolific designer of monumental sculpture; he is thought to have designed the York Water Gate in London, and is the documented author of the ornate Baroque gateway to St Mary the Virgin, Oxford. Henry’s mother was the daughter of the Amsterdam architect Hendrik de Keyser. Henry acquired the name of ‘Old Stone’ as a means of distinguishing him from his slightly younger brother John, who was never, apparently, a painter. Henry studied in Holland under his uncle, the distinguished Dutch portraitist Thomas de Keyser (1596-1667). Between 1638 and 1643 he travelled in France and Italy with his brother Nicholas (the younger), returning to England to set up a successful business as a painter of portraits and a copyist of the works of Van Dyck (1599-1641), as well as carrying on his father’s craft of sculptor. In Rome, he met the great sculptor Gian Lorenzo Bernini (1598-1680), who asked him anxiously about the care and condition of the fine portrait bust of Charles I that he had sculpted from a famous painting of the King by Van Dyck (Royal Collection). In addition to painting and carving, Stone was the author of a short treatise, ‘The Third Part of the Art of Painting’. He is buried in St Martin-in-the-Fields. The Company’s portrait of Charles I (born 1600; reigned 1625-49) is neither copied from one by Van Dyck nor closely reliant on any of Van Dyck’s images of the King. Although he gained a reputation as a copyist of the Flemish master’s portraits, Stone made many on his own account, following his father in loyalty to the Crown and taking the King’s side in the Civil War. Our Hon. Liveryman Dr Alan Borg, in his History of the Company, has suggested that the Painter-Stainers in general held Royalist opinions at the time of the Civil War – as indeed their métier would imply: they were employed to add lustre to the occasions, not to mention the egos, of the rich and powerful. The Parliamentarians, by contrast - though not universally – set little store by flamboyant show. Oil on canvas 51 x 61 in. 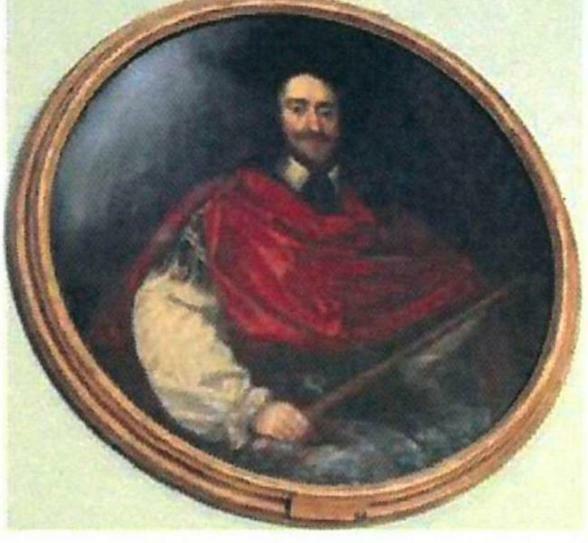 Both this and the group portrait of Master John Potkin and his Wardens have been severely lined and the quality of the original paint surface has largely been lost. Modern varnish has further reduced the sharpness of the images. Nevertheless the details of both pictures are fairly clearly readable. The latter presents its sitters almost without accessories, but here there are coats of arms and a prominent swag of green drapery, which in its handling recalls the shimmering fabrics that feature in the portraits of William Larkin, who joined the Company, as Borg conjectures, in 1606, and died in 1619. Although the layout of the composition is conventional, as can be expected of almost all portraits from this period, the characterisation of the individual faces is of some quality, and the presence of three devices or escutcheons painted on the background close to the three sitters confirms their identity. They are, however, not the usual trio of Master flanked by Upper and Renter Wardens (as shown in the Potkin picture). 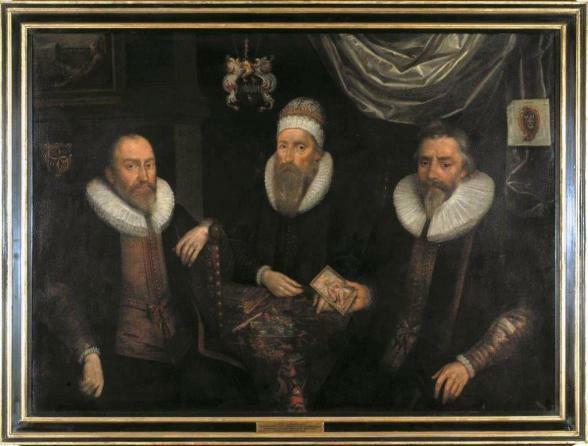 Here, Pargeter, who was Master both in 1624 and in 1629, has his Renter Warden for 1624, Thomas Babb, on his right but on his left neither of his Upper Wardens, Martin Hall (1624) or Henry Isaacson (1629), but William Peacock, who became Master in 1634. This was clearly not, as Borg points out, a standard record of the senior officers of the Company in either of Pargeter’s years as Master. He died in March 1631, and that year is given in the inscription on the picture. In the same month, the Court issued an order that a large unpainted canvas - ‘the cloth that is in the great frame unwrought’ should be ‘delivered unto Mrs Pargiter to be at her disposing to have her husband’s picture wrought in it’. While the Potkin group remained in the Company’s possession throughout its history, the Pargeter picture ceased to be a part of the Company’s collection at some period still uncertain. But it was still displayed in the Hall as late as October 1648, when it was ordered to be ‘removed close to the clock and the picture of Mr Knight, Mr Constable and Mr Holmden set in the same place.’ (These had been Master and Wardens in 1647. Their picture as not survived.) The fact that the Pargeter picture was still on the wall is an indication that it was in some way exceptional. It was presumably painted to commemorate not merely Pargeter’s Mastership in two different years, but his lifetime’s service to the Company; and his two companions were probably friends and associates of especial importance to him. It is also evident that the deceased Master’s widow was instrumental in causing the picture to be painted. It may have been at her insistence that Pargeter is not depicted with any of the conventional signs used in portraying the dead. (He is not introduced as an image on the wall behind the other sitters; nor is he wearing a shroud.) He is shown as he would be in any depiction of a Master, very much alive, and flanked by two colleagues, though he is the only sitter to boast headgear: he wears a striking embroidered and lace-edged skull-cap. He has a book and writing implements on the carpet-covered table in front of him. William Peacock, to his left, displays a picture, presumably a specimen of his work, a miniature depiction, perhaps on ivory, of Saint Catherine of Alexandria, kneeling and with a glory bursting above her head. (Englefield suggests that the subject is St Luke, patron saint of artists, but this seems not to be the case.) Behind Thomas Babb to the left hangs a framed painting, of which we see only the corner. It appears to be a grisaille representation of a sleeping man, very possibly, as Borg suggests, a soldier in a Resurrection scene. These objects, including he escutcheons, all represent aspects of the skills and crafts offered by Painter-Stainers. Their employment of grisaille as a standard medium for decorative work is well demonstrated in the series of subordinate panels in the Painted Chamber. When the picture was in the possession of Lord Monson, it was ascribed to the Dutch portraitist Cornelius Johnson (1593-1661), a member of the Company and one of the most famous of the Jacobean portrait painters in working London before Van Dyck. That attribution cannot be sustained; John Crows, who is recorded as an apprentice of Johnson’s in 1625, might be advanced as a possible candidate for authorship of the picture. The condition and recent conservation history of this triple portrait are similar to those of the Pargeter painting, though unlike the latter it has remained in the Company’s collection since it was painted. 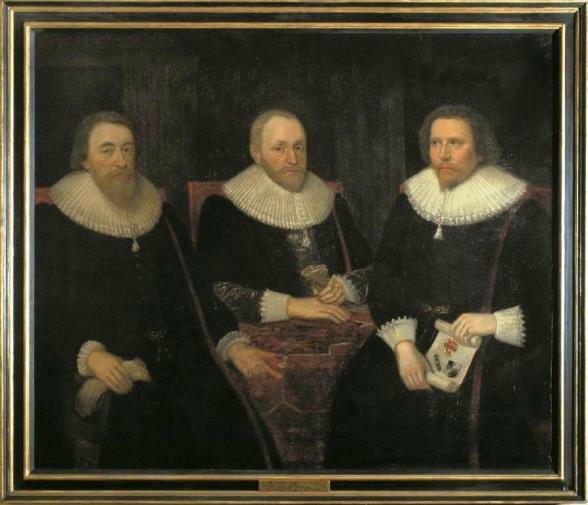 Potkin, Carleton and Taylor were Master and Wardens of the Company in 1631, and their group portrait was installed in the Hall in September of the following year. This is a notably less elaborate work than the Pargeter triple portrait. It contains no glistening drapery or coats of arms, the table on which Potkin leans is carpeted but otherwise bare, and there are no specimens of work on view except for a modest scroll with three heraldic devices, the arms of the three sitters, rather shyly opened to view by John Taylor on the right. Taylor is of particular interest as the reputed painter of the Chandos portrait of William Shakespeare, in the National Portrait Gallery, the earliest and most plausibly authentic likeness of the playwright. There is a possibility that this picture is his work also, though it is to be noted that Taylor is not shown looking out at the spectator, which was an accepted way for an artist to ‘sign’ his own work. It is at least possible that the Potkin and Pargeter pictures are the work of the same artist, and the fact that the two pictures are similar in general conception and appearance, and were produced within a year of each other, tends to support that suggestion. Thomas Evans was Upper Warden in 1664 and Master in 1666-67. Pearce’s bust may date from that time but is generally assigned to a decade later. 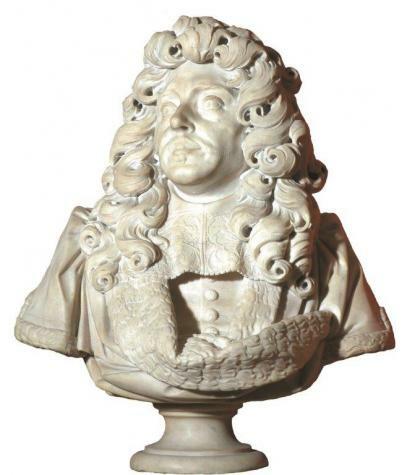 It is a superlative example of Baroque portrait sculpture, reflecting the influence of Bernini – especially perhaps the bust of Louis XIV of 1665 at Versailles; another fine bust by Bernini, that of Sir Thomas Baker, dating from 1638, was in England, in Sir Peter Lely’s collection, by 1680 (it is now in the Victoria and Albert Museum). But Pearce’s bust is an assured and imaginative work in its own right. The spectacular undercutting of the sumptuously curled wig and the delicate lace bands at his neck are incorporated into the easy rhythms of an entirely natural and unforced pose which is at the same time grand and expressive of vigorous movement. Most sculpture of the time to have come down to us with the artist’s name attached is by practitioners from abroad – van Nost, Rysbrack etc. Pearce reveals himself here as an independent master worthy to stand alongside them, and indeed was a prolific and celebrated artist, a sculptor in both wood and stone as well as painter, in his day. His father, also Edward, was a Painter-Stainer who died in 1658, an artist ‘of some repute’, as the Dictionary of National Biography says, as a painter of decorative panels and altarpieces for City churches, though none of these are extant. Pearce attracted attention when he executed wood-carvings for Sir Charles Wolseley at Wolseley Hall, and went on to carry out much work for Wren at St Lawrence Jewry and several other City churches, as well as the Guildhall. The dragon on the weather-vane of St Mary le Bow was designed by him.The wooden swags and drops that he carved in 1664 to flank the front door of Painters’ Hall have survived the vicissitudes of fire and bombing, and are now in the entrance of the new Hall, and his glass-painting of the Royal Arms is also preserved in the Court Room. In 1685, at the expense of the Fishmongers, he produced a statue of Queen Elizabeth for the Royal Exchange, for which place he also made a statue of Sir Thomas Gresham. His bust of Wren is in the Ashmolean Museum, Oxford. The bust was restored and cleaned by Taylor Pearce Restoration Services Ltd in 2017 which was paid for by a generous donation from Past Master Peter Hammerson (Master 2009).